If you’re looking for a healthy breakfast that’s both high in protein and rich in complex carbs, we’ve got it. 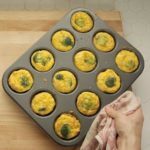 These super easy-to-make Sweet Potato Egg Cups combine the two and essentially creates a mini frittata! Plus, since you get two per serving, and there’s 12 egg muffins…that gives you six days worth of grab-and-go breakfasts. Or, you can freeze them and reheat them when you want them! But, there’s something extra special in these egg muffins that helps them stand out from the rest of the egg cup pack. The shredded sweet potatoes taste like hash browns! Once you grate or shred the sweet potatoes using a standard kitchen grater or use the grater attachment for your food processor attachment, give the sweet potatoes a few squeezes with a paper towel to absorb any excess moisture. Then, press them into a muffin pan, filling the cups about a third of the way. Don’t overfill them, or there won’t be room for your eggs. You’ll see in the video below that we used a disher (also known as an ice cream scoop) to divide the sweet potatoes evenly between muffin cups. Bake them for about 15 minutes at 375° F so the hash browns can get golden brown and crispy. While the sweet potato hash browns bake, scramble a dozen eggs and sauté broccoli and onion. Combine these and then, spoon or ladle the egg mixture on top of the baked sweet potatoes. Fill them all the way to the top. Place a baking sheet under the muffin pan as they bake to catch any egg mixture that might bubble out. We used onion and chopped broccoli florets in this recipe, but you can substitute with the same amount of your favorite vegetables, like bell peppers, mushrooms, and asparagus, or try scallions or shallots instead of onion. They can be kept in the refrigerator for a few days, and freeze well if you plan to keep them longer. Simply reheat in a microwave or toaster oven. Make breakfast easy this week with these tasty Sweet Potato Egg Cups. They're like mini frittatas! Lightly coat a twelve-cup muffin tin with spray. Set aside. Squeeze moisture from sweet potatoes using a clean kitchen towel. Combine sweet potatoes and 2 tsp. oil. Season with salt and pepper if desired; mix well. Divide sweet potato mixture evenly between prepared muffin cups; press sweet potato mixture into bottom and sides of muffin cups. Bake for 14 to 16 minutes, or until edges are golden brown. Set aside. Add onions and broccoli; cook, stirring frequently, for 4 to 6 minutes, or until onion is translucent. Remove from heat. Set aside. Place eggs in a large bowl; whisk to blend. Add onion mixture; mix well. Evenly pour egg mixture into muffin cups. Evenly sprinkle with cheese. Bake for 15 to 18 minutes, or until a toothpick inserted into the center of cups comes out clean.